If you are going to go it alone as a single or as a couple, or even friends or siblings buying a place together then you will need a minimum of 5% of the purchase price as a deposit. This 5% deposit is what is known by the mortgage insurers as “hurt money”. This is how the mortgage insurers think, “If you have suffered some pain, sweated some blood” then you are a much lower risk of failing in your commitment to the deal. They measure their “hurt money” by what they term “genuine savings”. To demonstrate that you have what it takes, they generally want to see your savings account statements for a period of three months, to show that you have been disciplined with your savings. The account balances, if you are using more than one saving account, should have been built up, or held steady over the last three months, and the mortgage insurers will want to see this by way of you providing bank statements. This is option 1. Option 2: if you have not been able to save effectively because you are paying rent, you can use this to your advantage. You can use evidence that you have been paying rent through a real estate agent instead of saving as evidence that you have been disciplined with this type of commitment. You still need to come up with the 5% deposit as far as having the money goes, but it’s not critical that you “saved it all up yourself” in other words you can raise the 5% from any means, i.e., a gift, a tax return, a bonus from work or the sale of an asset, like a car or bike. The only proviso is that it can’t be borrowed. A third option is using family to assist. Consider this scenario, kids want to buy a house, mum and dad want to help, but they say “we don’t have any cash to give you, but we have a house, can’t we use the house” in the past this was a No No, but today many lenders have a policy where they will allow parents or direct family to offer a property that they own as a “co-security” to assist with the purchase for the kids. Basically the bank will accept equity in the family property by way of a second mortgage, in lieu of a cash deposit. Now there is a downside and an upside to this. The upside is that under this policy, there is no requirement for mortgage insurance, so there is a significant saving there. The downside is that your parents or family are “in the game” with you until such time as they can be released by either paying down the loan or your property value rising so that they are not needed for equity anymore. Some banks do this better than others, so make sure you get the right advice or shop around so you find the right deal for you. 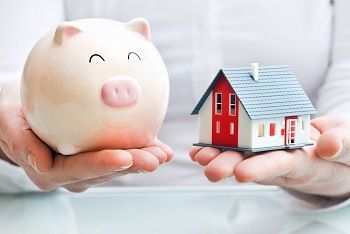 With option 3, you may be able to buy a home with no deposit at all. If you are entitled to the first home owners grant, this will pay for your expenses, such as legals and transfers etc with money to spare. So as you can see, there are ways to buy your first property with little or no deposit. Before you make a decision on which one is right for you, make sure you talk to you finance professional to explain all the options and what it means for you. Remember, the smaller your deposit, generally the larger your repayments will be, so make sure you know your budget and comfort level with repayments so you don’t get yourself in over your head.